Discover how self myofascial release techniques, such as foam roller exercises, can improve your posture, flexibility, blood flow and your overall wellbeing. Self myofascial release is a form of self-massage. It involves applying pressure along your muscles by rolling your body against an object (or rolling an object against your body). The objective is stretch the “muscle fascia” and target “trigger points” to remove knots and tightness. To gain a deeper understanding of self myofascial release, it’s necessary to briefly discuss the topic of muscle fascia (which, by the way, is where ‘myofascial’ comes from). Muscle fascia is the soft layer of tissue that covers all the muscle tissue throughout your body. It’s purpose is to help protect and hold the muscles in place. …Well, long story short: You need to keep your muscle fascia healthy. The muscle fascia often becomes tight or constrained for any number of reasons: Too much of a certain activity or movement, not enough stimulation of certain muscle groups, general overuse of groups muscles or injury – among other things. Basically, you’re at higher risk for problems if you do a lot of repetitive activities like sports or, hmmm… weight lifting! The problem starts when trigger points form. Trigger points occur in small areas within the skeletal muscle tissue, and are sensitive to pressure. They are distinguished by dense, hardened strips of muscle tissue. Put simply, they are muscle “knots” that hurt like hell when you press down on them. …So do something about it! Prevent it or treat it using self myofascial release. Self myofascial release exercises work by manipulating the fascia and the underlying muscles to “massage out” those nasty knots and keep your muscles pliable. Importance for Weight Lifting. It is especially important for you, as a weight trainee, to perform self myofascial release, even if you don’t have any ailments, aches or pains. Weight lifting obviously involves using the muscles intensely and frequently, which by itself puts a great deal of stress on the muscles and the fascia. And although weight lifting is one of the best things you can do for yourself, it also brings possibility of training with sub-par technique or in a way that causes a muscular imbalance (e.g. too many push exercises). All the more reason to use self myofascial release to bring your body into balance! 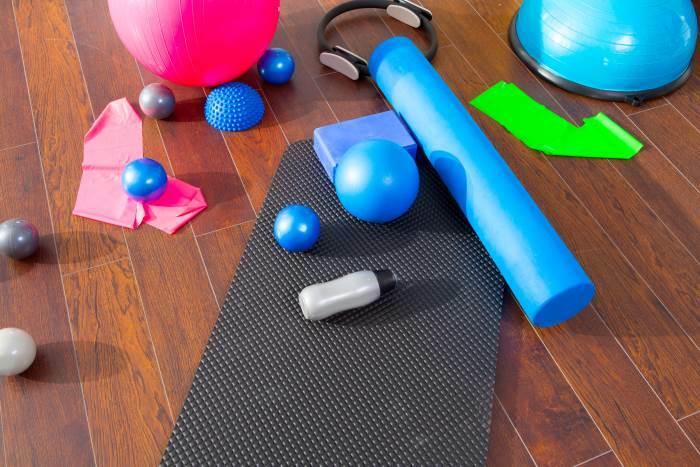 36″ Foam Roller – A foam roller is the most efficient self myofascial release tool. It allows you stretch the fascia on the major muscle groups (e.g. quads, hams, IT band, back, lats) with ease, and in the shortest amount of time possible. You can hit other, small and midsized, muscle groups (e.g. chest, arms, shoulder, glutes, calves) but not as precisely or efficiently. For how-to technique guides, check out my article on foam roller exercises. Lacrosse Balls – You can target small and otherwise difficult-to-target muscles (glutes/piriformis, shoulder, arms, forearms, calves, bottom of feet). You can also apply much more pressure to a given area than is possible with a foam roller. Watch this and this to see specific examples of exercises. The Stick – The Stick is like a thin rolling pin; you hold the ends, and roll it over your muscles like they’re dough. It’s covers a greater surface area than a lacrosse ball, but it is more precise (depending, of course, where it’s used) because you control it with your hands. This tool is great for the quads, hams, IT band, hip adductors (inner thighs), front and back of calves, neck and front of the hips. (Note: This is the only product I don’t own out of the four listed on this page, but it’s on my wish list!) Here’s how it works. The Original Backnobber II – This tool is best for targeting specific, and often hard-to-reach, trigger points. It’s unique design allows you to take advantage of leverage, so you can minimize strain while maximizing the amount of pressure applied to a given point. I find it works really well on the neck, upper back and traps and the region around the top of the glutes. Watch this to get an idea of how it works.